Paul Holleran has added trialists Chekaine Steele and Anthony Dwyer to his squad after both impressed in pre-season. 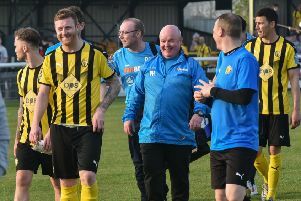 Steele has featured in all five of Leamington’s friendly fixtures, netting a penalty against Racing Club Warwick and scoring the third at Bedworth, while Dwyer was introduced in the 3-0 win at The Oval, scoring the opening goal, started in the 2-1 home defeat to Birmingham City Under-23s on Wednesday evening. However, Liam Canavan looks to have played his last game for the club having accepted a job in Bournemouth. “We have reached agreement with both Chekaine and Anthony and both have been added to the squad,” said Holleran on the club’s official website. “Chekaine was a good player at this level for Worcester City a couple of seasons ago and has good experience but he has had a few setbacks with injuries. Holleran also explained why Canavan has not been a part of the club’s pre-season campaign. “The reason Liam has not been involved at all during pre-season is that he has been relocated with his job and is down near Bournemouth at the moment. Striker Ryan Harkin, who featured from the bench in Brakes’ opening two friendlies, has committed to Coventry Sphinx for the forthcoming season. The joint winner of last seaon’s Midland Football League Premier Division Golden Boot had been training with Leamington but has decided to rejoin Lee Knibbs’ side. Brakes complete their pre-season schedule tomorrow when they entertain Bromsgrove Sporting.